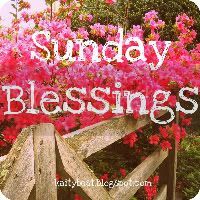 I never got around to posting my Sunday Blessings yesterday, because I've been so busy the past few days! So today, I'm taking some time to share all the wonderful little moments God has graced me with this week. Well friends, I seriously got matched with the best swap partner ever. Kait @ GridIron Lipstick sent me the cutest ornament! We found out that we're both PA girls, and after I told her I had partied at her alma mater in college, she sent me such a fun ornament from Pier 1! Thanks Kait! I love it! I'm also getting really excited about our Secret Santa Swap coming up. I'm so happy that so many girls have expressed interest (Insert shameless plug: If you want to be one these girls, enter HERE!). Hope you all enjoyed your three-day weekends as much as we did. Lord knows, it was much needed! I'm so excited about the Secret Santa Swap!! Can't wait :) And I'm going to do my Sunday Blessings and linkup right now. That photo of the car window made me smile... so sweet. We're so lucky to have such great husbands. Awww, I love the message that your hubby left on your car!! Love your cute ornament Kaity. Thanks for swapping. I already signed up for a secret santa otherwise I'd sign up for yours. Happy Holidays! Dropping by from the ornament swap link-up -- I've been loving seeing everyone's ornaments! So cute!